Renowned artists namely Manjula Gururaj, B R Chaaya, Satya Prakash Batnagar, Manoj George, Praveen Godkindi and Praveen D Rao came to honour the legend Ms Ashaji. 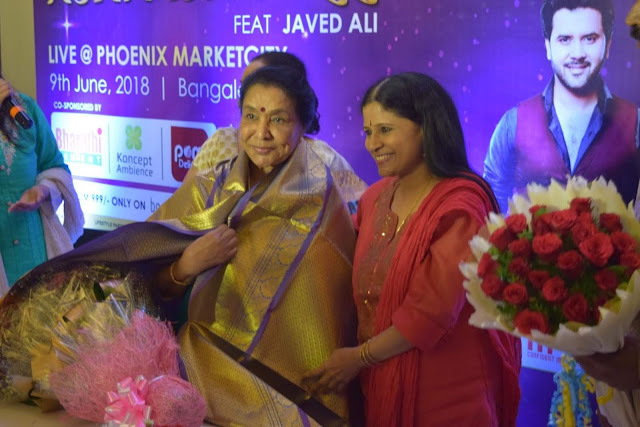 Gajendra Singh Rathore, Centre Director Phoenix Marketcity said, "She truly is an icon in the world of music and we are glad that she will grace the stage at Phoenix Marketcity Bangalore. She has a had a wonderful career, one that has spanned 6 decades entertaining fans not just in India but all over the world and we all are really looking forward to watching her perform live for the very first time in Bangalore." Asha Bhosle was overwhelmed by this love shown by fellow musicians and that she felt honoured by their felicitation. She also said that she was so happy and touched that they had made the effort of joining hands to come and show their respect to her. She said she was all ready to entertain the Bangalore crowd with her music.